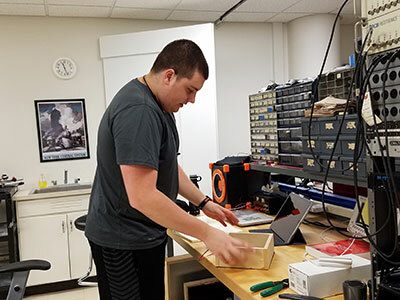 Gregory Hernandez ’20 is an audio and music engineering (AME) major who transferred last year from Syracuse University, after learning about the AME program here at the University of Rochester. He had spoken to his mentor, Mark Bocko, the chair of the Department of Electrical and Computer Engineering, about doing research here even before he arrived at the university. Hernandez found out about the Xerox program while looking at the Kearns research opportunities web page and saw that Bocko had a research project opportunity working on flat-panel speakers. Hernandez jumped at the chance, and his passion convinced Bocko that he should be a part of the project. 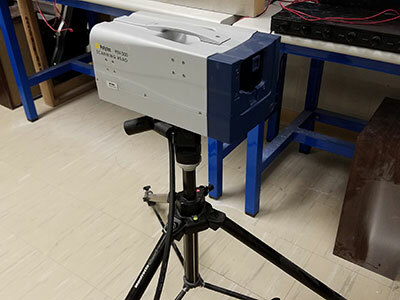 The laser vibrometer that Hernandez and Heilemann use to study speaker quality. 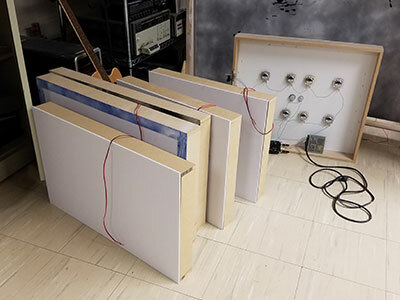 In the lab, Hernandez learned how to design flat panel loudspeakers to avoid problems with sound output that tend to happen at high frequencies, and discovered the differences in design between larger flat-panel speakers and smaller ones. Hernandez also worked closely with Mike Heilemann, a former graduate student of Bocko’s and a new assistant professor in the department. They use a device called a laser vibrometer to image the way the speaker panel ripples as sound moves through it. There’s a great variety of tasks that Hernandez does in the lab, from building drivers and speaker frames, to soldering wires, coding in Matlab, and reading about experimental design. Sometimes, he and his labmates go to SUNY Binghamton to test equipment in the anechoic (sound-absorbent) chamber there. Hernandez hopes this experience will be a jump start into his career goals of earning a PhD and working at a large audio technology company as an acoustic engineer, designing and building speakers and sound systems. Some of the speakers that were built in the lab. Bocko chose to become a mentor because of his own experience as an undergraduate doing summer research. From his perspective, the point is not necessarily what is achieved in the lab – it is about gaining experience and building confidence. Hernandez at his work station.